EZNC | The most dangerous snake? A standard measurement of any toxin is the LD50 (LD = lethal dosage): the amount of toxin required to kill half of the test-animal population. A low LD50 value indicates a potent toxin: only a small amount is necessary to kill the recipient. 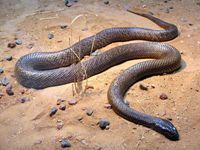 The inland taipan is so poisonous that the venom in one bite is toxic enough to kill one hundred individuals. This puts the snake at the top of the list of most poisonous snakes in Australia. However, this snake does not claim the most victims. That dubious honour depends on a combination of factors, including the potency of the reptile’s toxin, the chance that humans will encounter the snake (the population density of the area), the availability of antiserum, and the country’s healthcare system. In West Africa, many people fall victim to the saw-scaled viper. This very poisonous snake lives in slums, where many people walk barefoot. The puff adder as well, a snake common in Africa, claims many victims due to its effective camouflage. In fact, the puff adder seems to be responsible for the most African fatalities. In India, the Russell’s viper causes many deaths, even though this snake is not very high on the most-poisonous lists. Cobras are dangerous too. Every snake in the entire cobra family can ‘stand’ and increase its visual size with a skin flap, and some cobras can spit their venom as far as 2.4 metres. All in all, say people in the know, the best position for observing snakes in the wild is from a great distance.